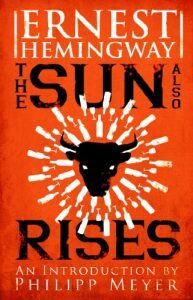 The novel is based on Hemingway’s trip to Spain in 1925 in which he experienced European café life and the running of the bulls in Pamplona. He wrote the novel in about two months, spending just a few months on revisions. It was published in 1926. The novel is an example of the Roman a clef, in which everything is based on the real life of the author. The characters are based on people Hemingway actually knew and the events of the novel are based on his own experiences. Though the novel remains popular and is frequently on academic reading lists, many contemporary readers find the anti-semitic themes which surround Cohn to be disturbing. Not everything about the novel has stood the test of time. The novel has been adapted into a movie twice and a one-act opera, although Hemingway himself had tremendous difficulty getting the novel into a film deal. The depictions of the bullfights persist in the American imagination to this day with many young people traveling to Spain to participate in the running of the bulls.